Discussion in 'Android Tablet News' started by gurgle, Aug 20, 2010. "Oh honeycomb won't you be my baby well honeycomb be my own". Sorry dating myself by singing an old song. Well that is what I thought after reading this story and a few other stories. Honeycomb will be an Android version specifically for the next generation tablet design. This design fork for Android makes sense. It is an incremental upgrade of Gingerbread rather than a total new version. There are clear differences between a tablet and a phone. This fork in technology will be similar to what happened with IPhone/IPod and the introduction of IPad. It shows the interest and recognition tablets and tablet technology holds for the future. Who knows maybe, those digital tablets we saw on all those Sci-Fi movies were Android. Firstly, I want to say hello to all contributors here on this excellent site - Its my No.1 source for tablet related news stories and articles. I've been a guest for many weeks, but felt I had to join. Progression is great, don't get me wrong, and of course tablets being the next big thing, you would expect rapid progression to be made. But, is it only me who feels that Android OS updates are too rapid. I won't buy 7" Froyo 2.2 Android, because of course the video dimensions are limted, and I want to wait for Gingerbread 3.0 OS (better dedicated tablet) 10" machines around Christmas (or more likely early 2011). But then again, if I waited till December, and were hearing more and more talk about Honeycomb 3.2, it might be worth waiting for a machine exploiting the features in Honeycomb. My point is progression is great but if too rapid, Google Android OS progression might be cutting its own throat. Of course with technology you always get something better / cheaper if you wait - I don't think many can argue with that, but leaks about updates to Android to me is undermining sales. But here we are now talking beyond Gingerbread to Honeycomb 3.2. How long till Honey 4.0??? It's understandable the buyer's reluctance to commit with the next-great-version beckoning just beyond his reach. But the cosumer's psychological waffling isn't really relevant here. What's relevant is that Google is in a race with Apple for the next mobile form factor, and Apple is ahead. Also, not far behind is a bunch of big-heavies (Intel MeeGo, MS WEC, HP WebOS) about to join the fray. 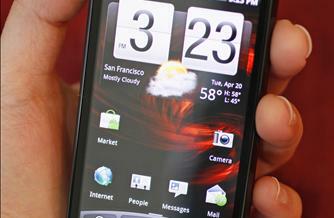 Android is still very much in its diapers, and can stand a bevy of improvements. Google can't afford to slow down, at least not until a baseline functionality is reached. For tablets, that has yet to occur. I think it's great that improvements are coming so rapid. That means we consumers will get better products faster. I wish they can go faster still. I don't want for Goog to turn into another MS, when we get a new rev after every 3-4 years, and then having to wait another year for a bug-fix version. I see more fragmentation coming. But I'm not sure how else Android can complete in the tablet market. I think what might slit googles throat if Oracles suit don't run off manufacturers is that the public might get the thought in there head that manufactures and google are using practicing what is known as planned obsolescence.. Basically deliberately planning and designing stuff so that it becomes obsolete quickly.. Now you really can't drop that on google but some of the device manufacturers do seem to be doing that.. Take the Droid as an instance of this. Great phone.. Great fine and wonderful.. It will upgrade to froyo but if I recall properly it's not going to be able to handle gingerbread.. Now as it stands now and to my knowledge the samsung galaxy s and the current uber phones will be able to get gingerbread.. Perhaps honeycomb as well but I am wondering if it will be able to handle the hambone release after that.. I don't see a problem with the fact there are in the early stages of planning of it's release after next because hell Ubuntu just released it's release after next.. Good and steady releases are needed.. But I just got a 2 year contract so my samsung vibrant needs to be able to keep in on the update game for at least that time. if from now to then google lets loose with android 5 then my phone needs be able to upgrade and also not be hampered down by such an upgrade.. The g1 was down and out with donut which came out a year after it's release. It gets it's 2 year anniversary in October. Ya sure it had an unofficial update but hackers had to specially fit it. If I recall googles position was that it had to small of a rom.. I don't know to say otherwise but i'd hate to think google is in on making products die before their time.. As far as manufactures well who would be surprised by that? Lot of newer tablets going to be delayed because of the backlog of chipset that were halted and now that production as started back up won't be a lot of supply on demand for all tablet makers including the iPad, Smart phone an etc. Well that version of Android OS would see the light of day maybe next year if the tablet manufacturers don't get enough chips to produce the product. I have honestly been expecting a fork for some time. The iOS for the IPad is not the same as the IPhone when you get to the kernel and core elements. This is not a bad thing. If anything, it will allow creation of business level apps which take advantage of the screen real estate. It is unfortunate that bleeding edge groups like we are , are a proving ground. Change is occuring a at train wreck speed. I think serialjoepsycho is like many of us who want the merry-go-round to slow down. It is that battle of "something new" consumerism making all of us bang our heads. This is why I keep saying the low-end tablets are designed as disposables. There is no consideration to things like Battery change. And if you look/listen to some of the dealers who post. They state up front. There is no plan for OS upgrade only Firmware support on the low-end units. In my opinion Chip production will hone and focus the "fabs" to make the cheapest and best selling chips. I remember the DRAM shortage. Shortage was not due to the economy, And it did not directly impact delivery, What it did do was dry up the sources for the low end units. The question will be whether to divert production to the low end but growing China market, or continue to pursue global interest. I do not see the market drying for IPads or Android Tablets. The market will change but not dry. Ooooo, you are dating yourself if you remember that song! Oops! I remember it too. Now it's stuck in my head.